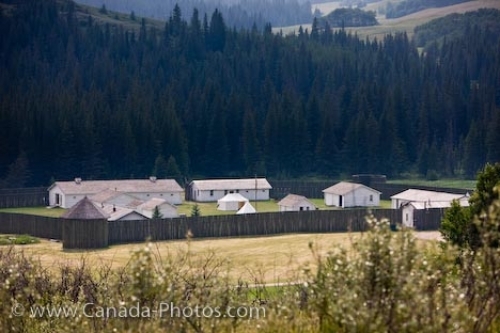 An view of the entire Fort Walsh National Historic Site in Cypress Hills Interprovincial Park in Saskatchewan, Canada. The wilderness of Cypress Hills surrounds Fort Walsh National Historic Site in Saskatchewan, Canada where the buildings were reconstructed to create a tourist attraction which takes people through seven thousand years of Canadian history. Costumed interpreters are found throughout Fort Walsh to help visitors stay in touch with the 19th century period of the North West Mounted Police. The original buildings of Fort Walsh were built on a level piece of ground near Battle Creek where they were secluded and sheltered by the natural beauty of Cypress Hills. Overview of the Fort Walsh National Historic Site complex, Cypress Hills Interprovincial Park, Saskatchewan, Canada. Picture of the reconstructed buildings and the fort at the Fort Walsh National Historic Site in Saskatchewan, Canada.